It’s the beginning of a new era, wrapping up the end of the Inhuman/X-Men war and bridging the way to next month’s launch of The Royals. Brought to you by the creative team of Al Ewing, Ryan Sook, Chris Allen, and Paul Mounts. 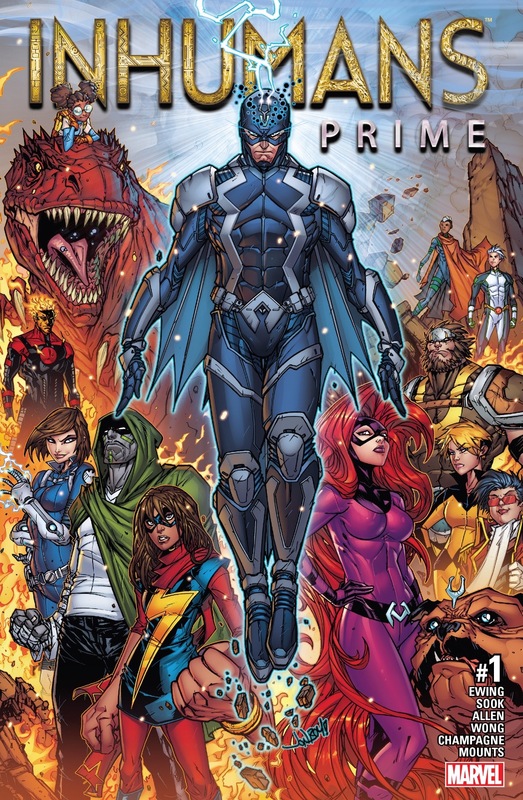 Issues like this, that are mostly set ups and are labels as ‘prime’ or ‘issue zero’ or ‘alpha’ are quite often perfunctory and usually entail short vignettes of various characters, acting as a kind of state-of-the-union that lets readers know where the players are at prior to getting the story under way. Writer Al Ewing bucks this trend and tells an actual tale, with action, mystery and intrigue. 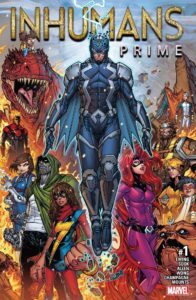 It’s still not essential reading and, with a lofty price tag, fans looking forward to The Royals, Secret Warriors, and Black Bolt can totally skip it without worrying that they’ll miss out on key details. The story begins in earth’s orbit where Noh-Varr’s apartment/Kree drop-ship circles the globe. Noh is watching the news on television and sees that the Inhumans and X-Men have ended their hostilities. Their war had resulted in the destruction of the Terrigen Cloud, eliminating all Terrigen and essentially bringing to an end the future of the Inhuman race. Noh is perplexed by this, but it quickly dawns on him that The Inhumans of this reality do not truly know what The Terrigen is. Noh is from an alternate reality and he possesses knowledge about the origins of Terrigen that could save the Inhuman race. The narrative switches to Arizona, where Maximus marches his band of ne’er-do-wells across the desert plains. Max’s gang, made up of Triton, Lineage and The Unspoken, follow him because they have no where else to go. 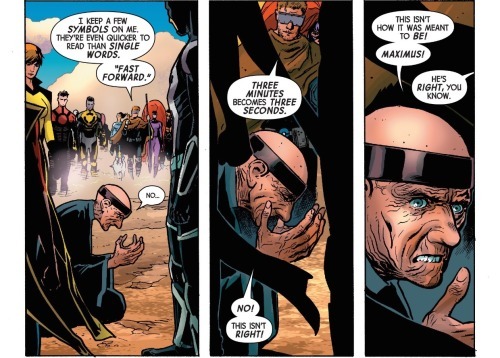 He had promised them glory and redemption with his plot to generate synthetic terrigen (as detailed in Uncanny Inhumans #’s 18-20) but it had all resulted in little more than a romp whereby Max gained critical knowledge and a bit of fun and the others were just used as pawns. 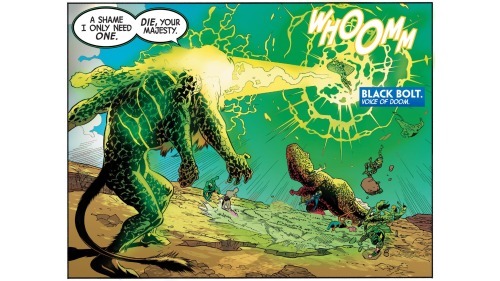 Lockjaw teleports onto the scene, bringing with him Karnak. Karnak is there to arrest these Inhuman criminals and bring them to justice on New Attilan. Yet Maximus is not done having his brand of fun and he uses his psychic powers to force Triton to do battle against his brother. Unable to resist Max’s influence, Triton attacks. The fight is quick and decisive. I don’t believe I’ve ever seen Triton and Karnak go at it before. Even though Karnak has never gone through Terrigenesis his ardent training and ability to perceive flaws easily offers him the upper hand on his brother. A swift jab to a critical point on Triton’s forehead renders him instantly unconscious. Still, Maximus is not content to go quietly. 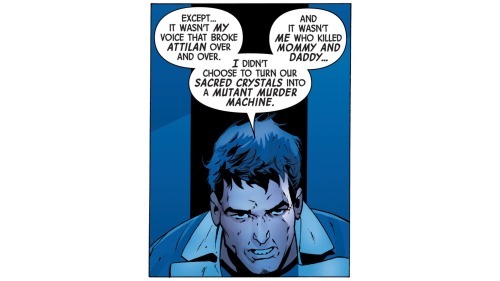 It turns out that he had save a last piece of Terrigen Crystal, feeding it to The Unspoken and endowing him with vast (albeit temporary) powers. Perhaps Max is influences The Unspoken, because for the first time that I have seen he uses his abilities in a creative fashion, transforming himself into a giant fire-breathing beast. Fortunately, Karnak’s arrival was merely reconnoissance and Lockjaw teleports in the remainder of Medusa’s forces. Herein we get a neat splash page showing us all of the central Inhumans (new and old) who are set to play a part in the books moving forward. 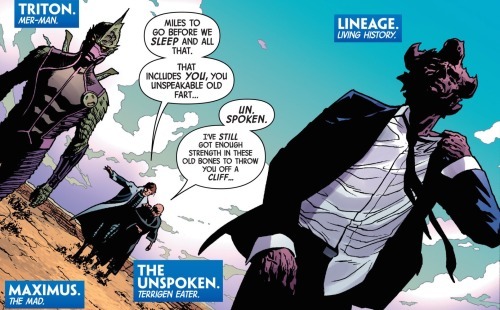 As impressive a force as all these Inhumans are, The Unspoken is still a formidable adversary while his powers last. He blasts Black Bolt from the sky and downs an embiggened Ms. Marvel with a spot of judo. As long as his powers last The Unspoken remains a terrible threat, yet Reader is able to neutralize it all by reading a tile with the fast-forward symbol from a television remote control. It causes the time in which The Unspoken’s powers last to speed up, making minutes into seconds and quite suddenly the Unspoken finds his powers spent, resulting in his shrinking back down into his withered and enfeebled self. And still Maximus is not ready to quit. Somewhere down the line Max has developed a much more potent version of his psychic powers. He is able to take over the wills of half of the Inhumans, forcing the newer Inhumans to fighter the older ones. The mayhem comes to an end when Lockjaw teleports in one last Inhuman. The empathic Captain Swain shows up and, as guessed, her own powers of psychic manipulation acts to cancel out Maximus’. Finally beaten, the mad prince is forced to surrender. Maximus is taken to New Attilan and imprisoned in a specialized cell that nullifies his psychic powers. Black Bolt visits his brother like he had so many times in the past. And once more Maximus baits and cajoles his brother with rambling insults. Just as Black Bolt has had enough of Max’s blithering, Max beckons him closer with the promise of a secret. 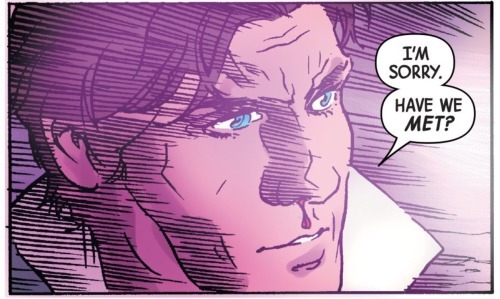 He whispers something to Black Bolt, something the reader is not privy to. Whatever this secret is, it shocks Black Bolt, leaving him visibly shaken and disturbed. Black Bolt leaves his brother’s cell and encounters Medusa. She can tell that he is upset and asks what is wrong, but Black Bolt refuses to tell. Interestingly, Medusa refers to Black Bolt as ‘my husband.’ I had thought their marriage annulled, but apparently this was not the case. Regardless, Medusa respects that her husband does not wish to discuss what it is that has so unnerved him. The trial of Maximus proceeds the next day. Likely at Black Bolt behest, The Inhuman healer, Panacea has temporarily surpassed aspects of Max’s neurological functioning, leaving him in an unconscious state. Gorgon wonders allowed why this has been done to him. 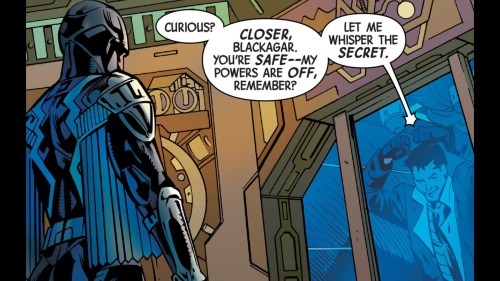 Panacea suspects that it is simply because no one wants to here his constant prattling, yet the truth is much more likely that Black Bolt doesn’t want him sharing his secret knowledge. It’s never made entirely clear exactly what Maximus is charged with, what it is that has necessitated this trial. Of course his many crimes are too numerous to list, but a little specification would have been nice. In any case, Maximus is sentenced to a life in prison, but in a prison on another world off somewhere in the cosmos. Exactly where this prison is located, who the jailers are, is left unsaid. My guess is that medusa is referring to the same prison set to play a key role in Saladim Ahmed and Christian’s Ward’s Black Bolt solo series set to launch in May. Following Maximus’ sentencing, Medusa gives a long speech addressing the future of Inhumankind. She has not only abdicated the throne, but also dissolved the monarchy. New Attilan will remain a sovereign state, but one under a new system of rule. And the young Inhuman, Iso, has been tasked with overseeing the transition. Iso gives a speech of her own, outlining her pledge to do her best to guide New Attilan into an uncertain future. Without Terrigen there will be no subsequent generation of Inhumans. Their culture and way of life has been put on a trajectory toward extinction, yet by remaining together, maintaining unity perhaps some semblance of what it means to be Inhuman may be salvaged. and Karnak taking his brother, Triton, to the Tower of Wisdom. A final clip shows Black Bolt standing atop the tower of New Attilan, watching a storm cloud rolling in the horizon. As detailed in the prologue, Noh is from an alternate universe and possesses knowledge of the Terrigen Crystals that may very well save the Inhuman race. Yet what this knowledge is and what sort of adventure Noh has in store for the Inhuman Royals will have to wait until next month’s first issue of The Royals. An interesting bridge between the older chapter of the Inhuman mythos and the one to come. There was some very cool parts to this issue as well as a few things that left me a bit cold. On the plus side of things, I’m hugely intrigued by the mysteries set up to play out in The Royals and Black Bolt. I’m a longtime fan of Noh-Varr and I’m very happy to see him brought on board. His advanced knowledge of the Kree from a parallel dimension makes him the ideal guide for The Royals’ upcoming sojourn into outer space. The advertisements for future issues of The Royals have hinted at Black Bolt possessing some monumental secret that could alter the fate of the Inhumans. 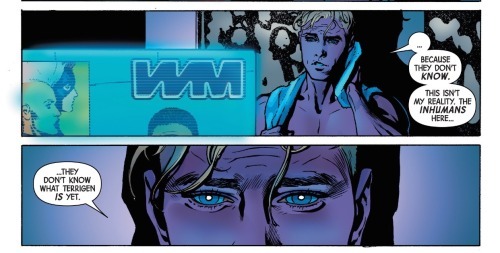 Whatever this secret is, it appears that Maximus has learned it as well and whatever efforts Black Bolt has made to bury or suppress this key knowledge may no longer suffice. I can’t wait to find out what it is. The action was pretty cool as well, the fight between Triton and Karnak being the highlight. And I was quite happy to see Triton offered a place in the Tower of Wisdom rather than being sent back to a human prison. Hopefully this will entail the beginning of Triton’s redemption and we will soon see ol’ Fishstick standing once again side by side with the royal family. There were two quick matters that I particularly appreciated (and that I feel bode well for the stories moving forward). 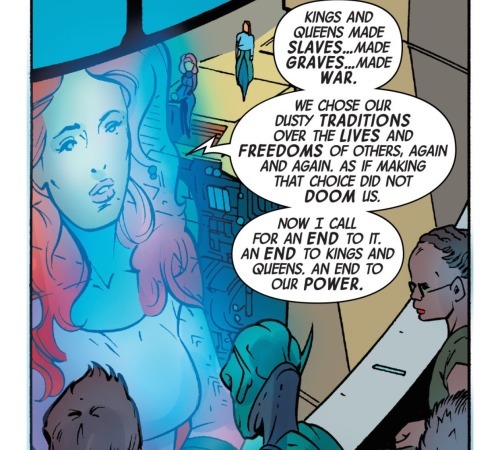 The first is Medusa’s acknowledging the folly of Attilan’s being a former slave state during her speech. The matter of the Alpha Primitives were completely omitted throughout the entirety of Charles Soule’s run on The Inhumans. It’s a good bet that Soule did so on the urgings of his editors; I’m guessing that sweeping the matter under the rug was an aspect of Marvel’s efforts to make The Inhumans more appealing to a broader audience. Whatever the case, I’m glad to see the issue will no longer be left unaddressed. It’s a shameful and disturbing aspect of The Inhumans’ history, but the mistakes of the past should never be forgotten. The second thing I appreciated was Maximus’ condemnation of Black Bolt over how the Terrigen Cloud had so terribly effect the Mutants. Although it was coming from Maximus, I’m glad to see the narrative relinquish the effort to recast the Inhumans as blameless on the matter. It offers me confidence that Al Ewing understands that the Inhumans are cool and interesting because of their flaws, not despite them. There were a few places where the dialogue was a bit stiff. 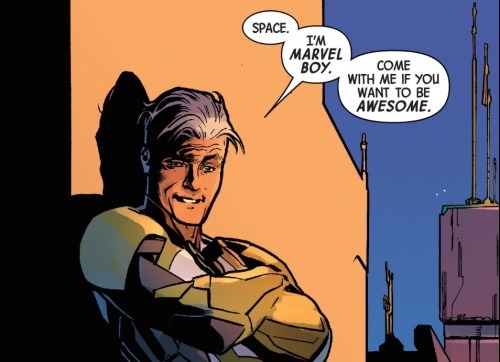 Based on interviews Al Ewing has been given, and tidbits gleaned from his twitter account, it seems as though Ewing is quite excited to get The Royals off the ground. Writing this bridge issue may have felt kind of like something Ewing just needed to get through so he can tell the story he is more interested in. The perfunctory nature of the issue seemed evident in parts. The whats and wheres of Maximus’ prison seemed to be purposefully vague. I’m guessing that Ewing did not want to step on Ahmed’s toes in terms of what is set to transpire in the Black Bolt solo series. I suppose this could have been handled with a bit more finesses, but it’s a minor complaint. Regardless, it’s looking more likely that Maximus may play a role in get Black Bolt solo, which is an exciting prospect. 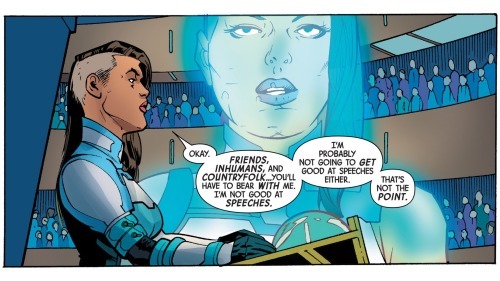 I’m sad to see that the Royal Inhumans are doing away with their official titles. It’s going to be hard not thinking of Medusa as a queen and Black Bolt as a king. 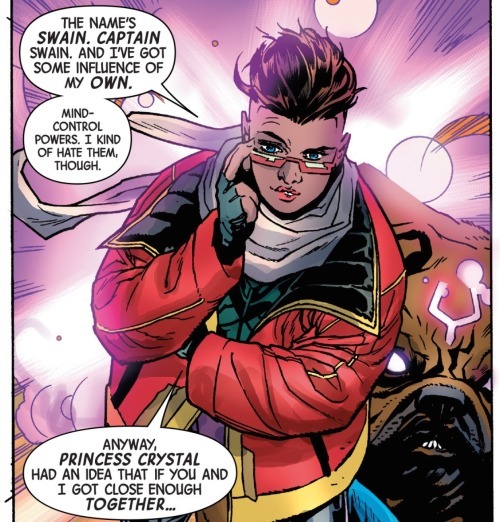 I hope that Swain continues to accidentally refer to Crystal as ‘princess’; perhaps it will act as a way of showing that this change is temporary, that the team will regain their royalty if they are able to succeed in quest to obtain a new source of Terrigen. It also bothered me to see Medusa refer to Black Bolt as husband. I’m hoping that winning back Medusa will be something that Black Bolt has to work on. Furthermore, it doesn’t sit well with me that their marriage hadn’t been annulled… it means that Medusa’s affair with Johnny Storm was an extramarital infidelity. Ryan Sook is a great artist, one of the best illustrators working in the field today. That said, his penciling for this issue does not in my opinion represent his best effort. A lot of it seemed rushed and some of the action scenes felt rather static. Both Medusa and Iso’s facial expressions were also kind of static and odd looking at times. While The Royals and Black Bolt received ample set-up, almost no attention was offered to The Secret Warriors. This is likely in deference to writer, Mathew Rosenberg. Rosenberg will be telling the story of what brings the Secret Warriors together amidst the backdrop of the Secret Empire event and it appears that Ewing is leaving the entirety of that tale in Rosenberg’s hands. A good idea and I’m sure Rosenberg appreciates it… still a little more page-time for Quake, Ms. Marvel and Moon Girl would have been nice. Minor complaints for a book that was overall quite satisfying. Again, this is by no means essential reading. It’s a fun read for Inhuman fans who have a broader comic book buying budget… but by no means crucial to those looking forward to The Royals, Black Bolt and Secret Warriors. Unnecessary but fun nonetheless. Two out of five Lockjaws.